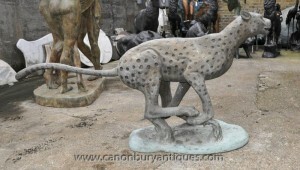 This is an amazing cold painted bronze Cheetah. The elegant Cheetah has a beautiful stance. There is beautiful cold painted detail to the cat’s face and body. This piece is offered in great condition. The Cheetah’s underside is marked with a ‘B’. A fabulous collector’s item and a great piece of craftsmanship.